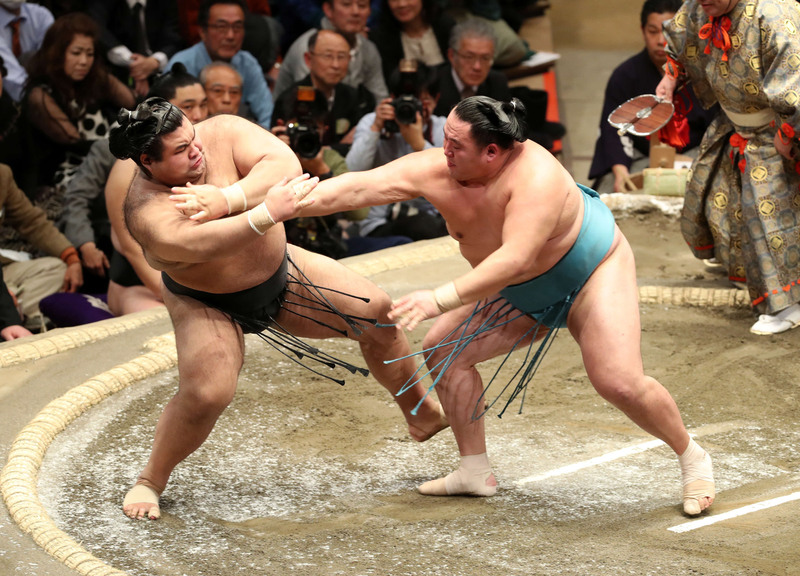 Mongolian yokozuna Hakuho maintained his lead after beating former ozeki Kotoshogiku on Monday, the ninth day of the New Year Grand Sumo Tournament. The 33-year-old Hakuho, the only yokozuna still in action, beat Kotoshogiku to keep a perfect record at the 15-day meet at Tokyo’s Ryogoku Kokugikan. He remains on course to extend his record number of makuuchi top-division championships to 42. After slapping Kotoshogiku’s face following the initial charge, the Mongolian yokozuna grabbed the 173-kilogram maegashira by the belt and thrusted him down. It was Hakuho’s 56th win over Kotoshogiku (4-5) in 62 bouts. 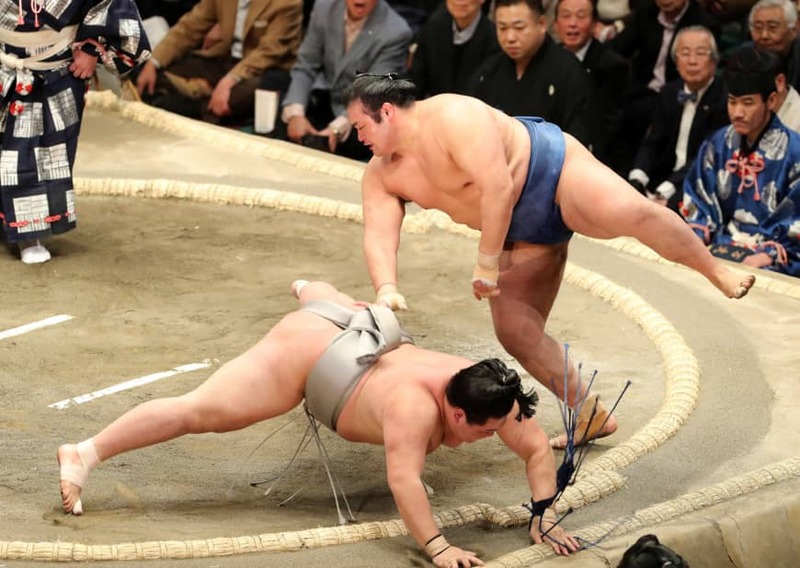 Rank-and-filer Chiyonokuni is alone in second place, trailing Hakuho by one win, while two ozeki, competing at sumo’s second-highest rank, lost their respective matches and fell further behind. Takayasu dropped to 4-5 after losing to sekiwake Tamawashi (7-2), while fellow ozeki Goeido was unable to resist powerful shoves by No. 4 Okinoumi (6-3) and suffered his sixth loss. The January tournament is missing a number of fan favorites due to injuries. The other yokozuna, Kakuryu, pulled out after going 2-3, and ozeki Tochinoshin withdrew on Thursday without winning a single bout. No. 15 maegashira Chiyonokuni survived a scare against No. 12 Meisei (6-3) to keep his hopes for his first Emperor’s Cup alive. Meisei attempted to flip Chiyonokuni down at the edge of the ring, but Chiyonokuni resisted and slapped his opponent straight down to the sandy surface. With the victory, the Kokonoe stable wrestler secured his first winning record since finishing 12-3 at the Summer tournament in May. In one of the day’s shortest bouts, Takakeisho pushed out No. 2 Nishikigi (4-5) in just 3.1 seconds. At 7-2, the newly-promoted sekiwake remains in contention for his second straight championship following his victory at the November tourney in Fukuoka. The two others who started the day at 7-1 — No. 8 Kaisei and No. 13 Yago — suffered losses and fell into a four-way tie for third. Brazilian wrestler Kaisei was defeated by No. 7 Ryuden (3-6), while Yago was unable to keep his winning streak going in his makuuchi debut tournament after losing to No. 11 Ikioi (5-4).